When developing a roll cage for your race car or offroad 4x4, you are required to join round tubes. 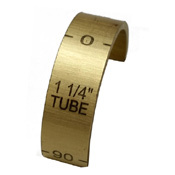 When a tube is properly notched it will fit against the adjoining tube with the maximum amount of surface area. This spreads the load and allows the weld joint to be as strong as possible. The process of preparing the tubes for welding, cutting of the fitment is referred to as notching or fishmouthing. Notching can be done in a number of different ways, and some methods are easier than others. The amount of time spent and the quality yielded, is greatly affected by the tooling used to make the notch. View Our Mobile Friendly Page Here! Secures thin wall or short pieces of tubing when notching. Works with ALL notchers! The "constant pitch" of Starrett hole saws have six teeth per inch, making for a smoother cut. They simply snap onto the tube and can be rotated or slide into position during layup. They're a handy way to keep reference especially when rotating or flipping a tube around to make a second cut. Typically that would be 180 degrees. Makes for a quick and easy rotational indexer. Notching made simple, a tutorial showing easy steps for making the perfect notch!